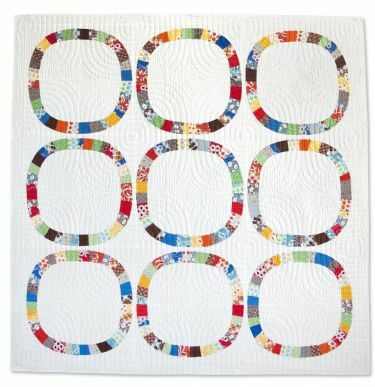 A quilt with hoops you don't have to jump through! This updated and revised version of Denyse's witty and timeless version of a Double Wedding Ring pattern includes guidelines for improvising the ring piecing, encouraging you to trust your instincts. Revel in the freedom, take some chances and give it a whirl! You're gonna make it after all! (That's for all of you old enough to remember MTM). The FWSG pattern includes easy-to-use instructions, templates (for the background pieces), and measurements to create baby to king sizes. Our sample features Denyse's Katie Jump Rope Legacy fabrics, but 20assorted print and solid fat quarters will make up to a king.